“The people of Manchester don’t stand with your xenophobia and racism,” one man shouted at the English Defence League racists. In the aftermath of Monday’s tragic bombing, the people of Manchester showed little patience with the racist opportunists of the extreme right English Defence League, quickly confronting EDL attempts at provoking a xenophobic and anti-Muslim backlash. The immigrant-scapegoating EDL picketed outside of the Arndale Mall Tuesday, spewing Islamophobic slurs and hoisting the Union Jack. The demonstration followed shortly after the panicked evacuation of the shopping center. However, the far-right horde was quickly outnumbered by counter-protesters. One man, filmed by Reuters, strongly denounced the EDL fascists while onlookers clapped and nodded. “The people of Manchester don’t stand with your xenophobia and racism,” he said, adding, “The people of Manchester are going to stick together, no matter what religion you follow, no matter what the color of your skin is. “We’re not going to stand with people like you,” he shouted at the right-wingers. “We’re going to stick together because together we are stronger and the people of Manchester are not going to be afraid of who is responsible for this violence,” he continued. 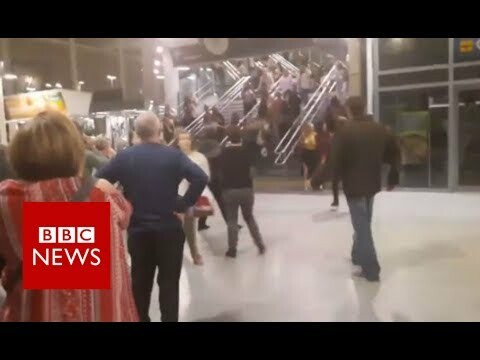 The explosion at the Ariana Grande concert claimed 22 lives and led to over 59 injuries and is being treated as a terrorist attack by the Greater Manchester Police. Responsibility for the suicide bombing has been blamed on Salman Abedi, a 22-year-old Mancunian whose parents are Libyan immigrants with longtime ties to the opposition against the late Libyan leader, Colonel Muammar Gaddafi. The United Kingdom under Prime Minister David Cameron took the lead — along with the United States — in the overthrow of Gaddafi in 2011, which also included France and some Gulf State monarchies. An alleged “humanitarian intervention” of limited scope, the campaign rapidly became a “regime change” effort that led to the dramatic downfall of Gaddafi and Libya’s plunge into all-out civil war, anti-Black African ethnic cleansing, and the transformation of the North African country into a base for various transnational extremist factions such as al-Qaida, the Islamic State group and the Libyan Islamic Fighting group. The attack was met by denunciations from a vast cross-section of people in the U.K., including Muslim leaders from the Ramadhan Foundation and Muslim Council of Britain. Muslim taxi drivers immediately offered victims and concert-goers free rides home following the explosion, providing them with water and letting them charge their phones to contact family and friends. Hopkins, a leading columnist for the Mail Online, was reported to police following her genocidal tweet. She soon deleted the tweet. Likewise, Israeli Prime Minister Benjamin Netanyahu sought to cynically ride the coattails of Monday’s tragedy, scurrilously tweeting that attackers like Abedi would “receive a stipend” from Palestinian Authority leader Mahmoud Abbas in a hypothetical scenario where the attacker was Palestinian and the targeted civilians were Israelis. Netizens were quick to denounce the Zionist leader’s shameless attempt to exploit the grief of Britons, pointing to the Israeli government’s tacit alliance with extremist Wahhabi Gulf kingdoms such as Saudi Arabia and its support for extremist anti-government forces in Syria.